Moving loaded or empty 40 foot and 20 foot ISO standard size shipping containers by barge is certainly an attractive possibility. This is being done successfully in other areas like Norfolk to Richmond. Now that the expanded Panama Canal is available container ships up to 13,000 TUE can transit the canal and bring containers to our river ports like APM Mobile and New Orleans. The largest and most successful COB operator is Seacor AMH LLC with corporate offices in Ft. Lauderdale, FL. To see their routs go to their Seacor routs page. Assistance is available to inland ports through the MARAD Marine Highway Program. If you are a shipper, port operator of chamber of commerce interested in increasing the profitability of businesses in your area through reduced inland shipping costs COB is certainly an option worth considering! We now have our 1/5 scale (half barge) COB example completed to show shippers on our tour. 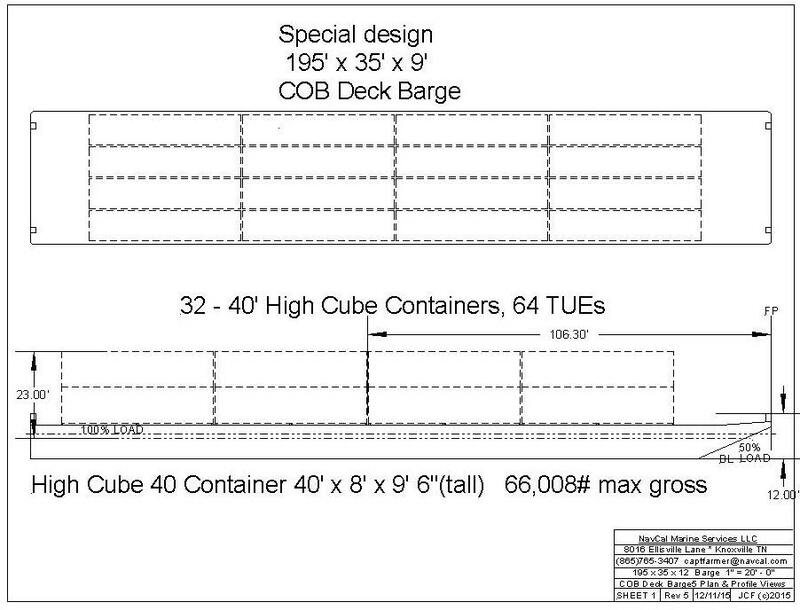 For COB operators here is a suggested, special design COB deck barge. This barge is a standard 195′ x 35′ that can be used in unit tows for maximum flexibility. These unpatented CAD drawings and supporting calculations are available free to any interested parties by sending an email request to captfarmer@navcal.com.